Last week was an amazing success! Thank you for your support. We are all so happy to have the market and park bustling on Tuesdays. We hope to see more friendly faces each week, especially as the variety of produce grows & changes with the season. Trillium Organics is bringing in freshly picked cauliflower, cucumbers, beets, and potatoes. The Local Gest will have a delightfully smelly table, full with garden greens, garlic, and fresh herbs! Haystrom Farm is bringing those beautifully-odd garlic scapes, new potatoes, peas and leafy greens. Life Spring Organics will have a full selection of roasts, steaks and ground beef. Animal Liberation Kitchen will be serving up fresh green smoothies, jackfruit tacos and veggie sliders with roasted peppers. Make sure you snag some garlic scape pesto from Earth + City while it is still in season. Also snack on some fresh collard wraps and strawberry rhubarb lemonade. Pick up some callaloo from Organic Vibes. They suggest you simmer it with garlic, onions, thyme and coconut milk. Madeleines will be serving delectable strawberry rhubarb pie. Made with rhubarb straight from Kyla’s mother’s garden! Stop by the Fifth Town cheese table and sample some of their delicious selections of cheese and Mennonite made sausages. 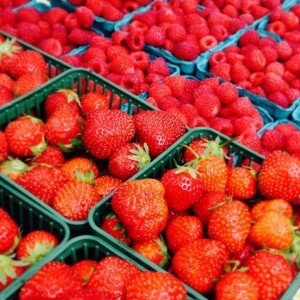 Strawberries & Rhubard are in season! Make yourself a compote with Moroccan mint, strawberries, rhubarb, and honey. Find a recipe here: http://bit.ly/1IG1ozh. Serve it over ice-cream or fluffy pancakes. 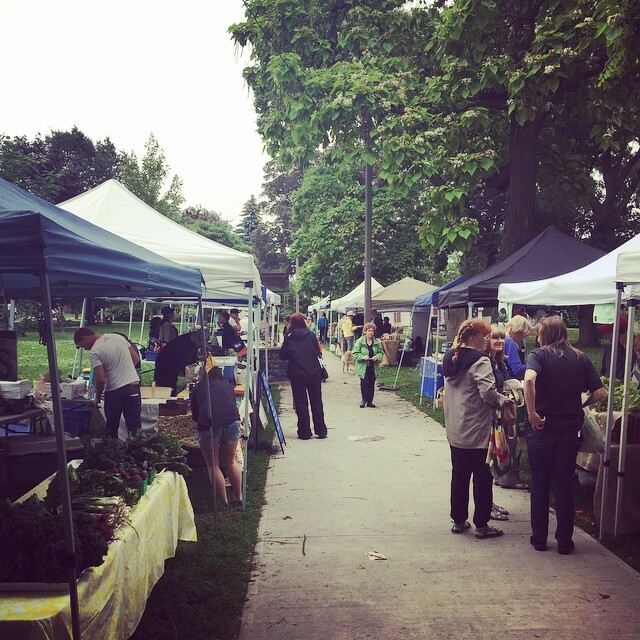 Next market day is Tuesday July 7th from 3pm-7pm.